Bookmaester - The Top 100 Indie Book Charts - Stats - The Letters From a New Planet: The Experience of the Life After Death. What the Heaven Realities are From a Point of My Mothers View, Who Left the Terrestrial Life. 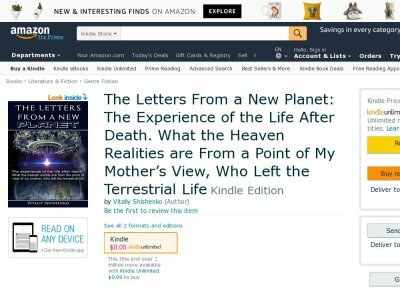 The Letters From a New Planet: The Experience of the Life After Death. What the Heaven Realities are From a Point of My Mothers View, Who Left the Terrestrial Life. 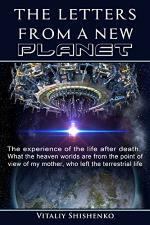 The letters from a new planet is a life after death book of my mother. The book is written in a style of fantasy story, but it reflects the real information that I received in the channeling act from the ascended master of the New Planet, whom my mother became there. The book describes the stages of the manifestation of my mothers soul in different cosmic worlds of the New Planet, as the ascended master of light. Information outlined in the book shows what history areas of training passed by the soul of my mother until she became an ascended master in the New Planet. This information shows for everybody who reads the book- that the life does not end due to an usual act of death, but has an amazing bright and rich continuation on the events and feelings of a fantastic life on the New Planet, where we will move in the process of individual or collective ascension in the future .The usefulness of this information opens up a new opportunities for individual meditation of each person in the transition to a new life in future. The author of the letters - the new ascended master shows the possibilities that conceal the familiarity with such information - as it unlocks the mental barriers to the transition into a new planet for everyone who acquaints himself with the content of letters. The letters tell about the extraterrestrial civilizations are involved in shaping with the cosmic worlds of the New Planet the Siriusians, the Pleiadians, the Orionians, the Adromedians and many others. Their models of the transformation within the realities of the New Planet and the opportunities that they open for each soul are shown here. Unlike other evidences of the postmortal experiences, the letters reflect a truthful information is received directly through out of channeling act and on the authors opinion, as the channeler, it is an interesting story in the literature on bilingualism, an interesting journey of the soul in the cosmic worldstone events within the New Planet. The book does not pretend to a best story has ever written in the style of fantasy, but sheds the light on this topic with a new perspective in the framework of completely different approach with theme - the life after death. What, in principle, does await each person after a death in the future picture of the Earth - there will be an individual approach for everyone who is passing into the thin worlds of the New Planet. But mutual features in the transition process to the New Planet will be taking place there. The life after death experiences stories inspires for people with hope and optimism, that life is beautiful.